We know the number is in the tens of millions, and we also know, based on bicycle sales that the number of bikers is increasing by double digits, as are the number of bicycle commuters. Millions of Baby Boomers are among the cadre of avid cyclists. Yet, as we age, our biking needs change. Going up hills is more daunting. And it turns out that even shifting gears has proven to be an impediment inhibiting Boomers and seniors from taking up the sport. But now there’s a revolutionary technology that allows you to adjust your bike’s ability to conquer almost any terrain without using real gears. It’s called the Nuvinci Continuously Variable Planetary Drive. And yes, that’s a mouthful. But it means that you can go from what traditionally would be a low gear to a high gear without having to move the chain from one gear to another. That means no jarring when you shift gears. It means no loss of power as you shift gears. It means no gears slipping. And it means no problems if you have to come to a halt at the bottom of a hill, or find you don’t have the speed to shift into a lower gear going uphill. The engineering behind the Nuvinci, by Fallbrook Technologies, seems a little like black magic. Instead of having gears inside the hub you have a series of rotating balls laid out around a center axle. Two rings circle the balls. 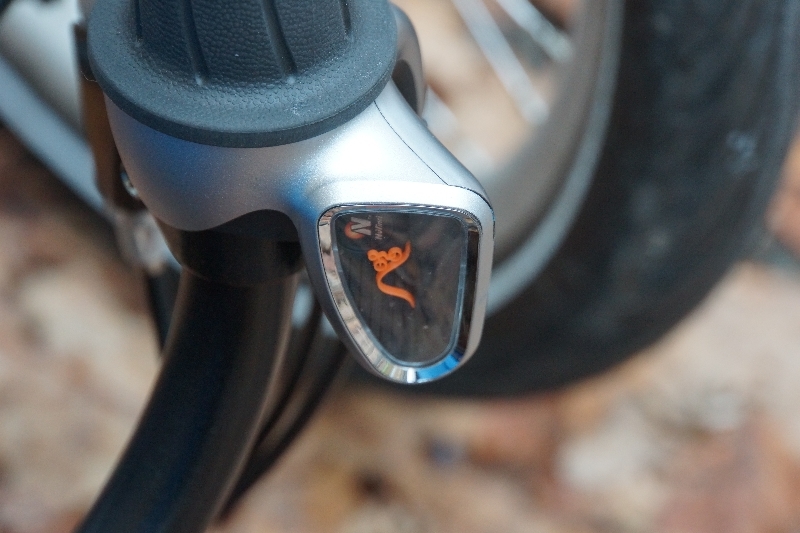 As you twist the handlebar mounted shifter, a cable is either pulled or released, and that changes the angle of the wheels in relation to the rotating balls, that in turn changes the output to your rear wheel. Because there are no gears, you might wonder how the entire system maintains internal traction so the balls and the ring don’t simply slip. The answer is the secret sauce. A fluid I don’t even pretend to understand. But it works. If a picture is worth a thousand words, I suggest you checkout the video below to give you a much clearer idea of how this all works. I replaced the rear gearing system on my Greenspeed recumbent tricycle with the Nuvinci 360N hub. In order to do this I needed to make some tradeoffs. While most traditional bikes come with a rear hub with 9 gears, my trike had that plus an internal cassette with an additional three gears, giving me a total of 27 rear-mounted gears. While some of those overlapped, collectively they represented a broader high and low range than what was offered by the single Nuvinci hub. So I had to choose which part of the gearing range I wanted to use. The decision was relatively easy since for me, the battle on the trike is always going uphill, never the speed on the flats or the downhill. So by choosing the appropriate rear sprocket I got about as low as I did with my original gearing system, but lost what feels like about 25% on the overdrive side. What I got for the tradeoff is a remarkably smooth riding experience. It even sounds smooth. My Greenspeed trike also has an electric assist motor from EcoSpeed that helps me up the hills. With the Nuvinci, combined with the low front end gearing that I get from a Schlumpf mountain drive system, I figured I could take on just about any hill. Then I got to Vermont’s Green Mountains, where I did fine until one hill on the way out of Warren, Vermont brought me to a halt. Had I been in a little better shape, I could have made it. But with that one exception, over a week’s worth of biking, the entire system performed wonderfully. As Nuvinci promises, there is no jarring or loss of power when you shift. A quick note here about the differences between upright bikes and recumbent. When you encounter a hill on a regular bicycle you can get up out of the seat and use your entire body for leverage. If it’s really tough, you can get off and walk. With either a two wheel or three wheel recumbent the only leverage you have on a hill is from your legs, so low gearing becomes essential. 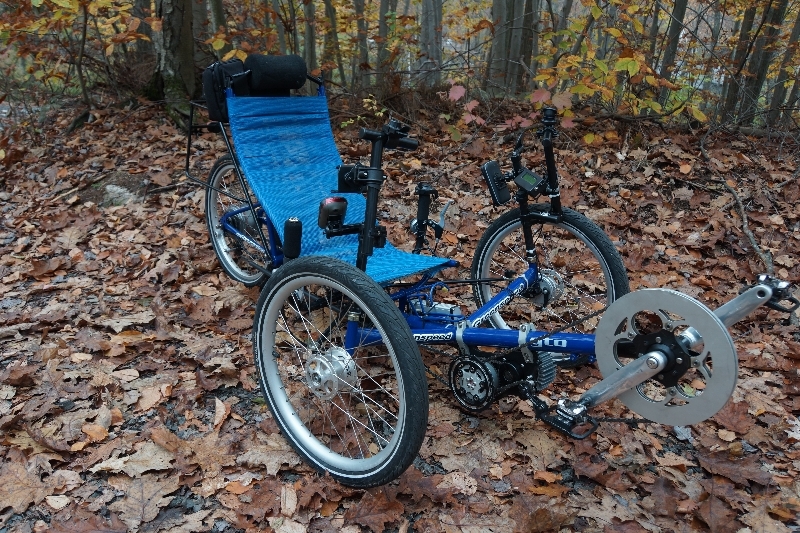 And with a recumbent trike, you really cannot even get off and walk it, since there is no way to walk it while standing upright. The Nuvinci is very sensitive to changes in terrain, more so than with traditional gearing. Even a slight uphill or downhill required some adjustment on the Nuvinci’s grip shifter. While Nuvinci supplies a small display for the handlebar that shows where you are in terms of your gear range from low to overdrive, you really don’t need it. A few minutes with the system and you’ll be able to feel it. I had no trouble adjusting the gearing going uphill, or even from a standstill. The Nuvinci N360 hub kit sells for anywhere from about $320 to almost $400. And unless you can do this fairly complex installation yourself, you can expect to part with another $200 or $300 to have your local bike shop do the job. However, there are now dozens of bikes , both traditional and electric that are coming with the Nuvinci already installed. Many were on display at both EuroBike and InterBike shows this season. Besides the hub, Nuvinci makes a complete automatic transmission system called the Harmony, which will shift as the terrain and your cadence warrant. Several bike brands are offering the system, including Bodhi. Fallbrook Technologies has already produced several models of the Nuvinci going back to 2007. But the chances are that unless you follow biking closely, you’ve probably never heard of it. Why not? Well the first fluid filled automatic transmissions were made in the mid 1930’s but didn’t become the automotive standard until the early 1950’s. But back then there was no Internet to spread the word. I don’t think Nuvinci has very long to wait before it becomes a well established entry in the lexicon of biking. Here is another post about the NuVinci N360 you might be interested in. I visited their engineering headquarters in Austin Texas and had the chance to ride the N360 on a number of e-bikes. Do you have any comments or questions for Gary on the NuVinci N360 or his Greenspeed trike with EcoSpeed electric bike kit? Please leave your comments in the section below. Re the Nuvi System. I like the idea of an enclosed system but what’s stopping me from buying an electric bike already fitted with this continually variable gearing is the uncertainty about the longevity of the unit. Have any endurance tests been carried out? Does the manufacturer of the ‘Nuvi’ gearbox provide a warranty or guarantee for this unit and if so, for how long is it warranted? Who pays for the shipping costs to have the unit repaired/replaced during the warranty period?? I have not had any service or warranty issues with the unit. I suggest you reach out directly to Fallbrook Technologies to get the specifics about warranty work. Do I have to top up my front fork suspension with air? Only had a standard bikd before getting this Kalkoff. Hi Kev, it is a good idea to check your front fork air pressure every few months. Most modern suspension forks hold air pretty well. I understand and have experience with continuously variable drive systems which shift themselves based on input RPM centrifugally overcoming opposing spring pressure to vary mechanical advantage (gearing) to the output. On this type of system, a load (like a hill) would lower the input RPM and instantly increase the mechanical advantage to the output (it downshifts and upshifts automatically without a cable or shifter). That is not the case with the NuVinci as I understand it (unless I’m wrong). If a cable shifter is used to mechanically adjust the variable ratio (mechanical advantage)within the hub, then the ratio of mechanical advantage should stay in the (gear) ratio you select with the shifter. Just like a traditional gear shift bike, if you put it in 3rd gear it stays in third gear. If you put a NuVinci hub in a specific ratio with the shifter, it should stay in that ratio until you adjust it with the shifter. Why? It should be exactly like a “traditional gearing” system regardless of the terrain, uphill, or downhill you encounter. Is the NuVinci affected by load, velocity, or any other factor that can change the ratio without having moved the cable shifter? 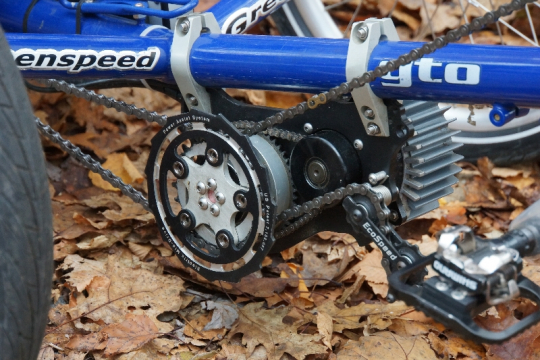 The answer may be related to the use of the EcoSpeed motor on your bike. This, combined with your pedal input would apply tremendous amounts of torque into the hub, which might do unusual things like compress the cable housing and or stretch the cable slightly. That would create enough change in ratio that you would want to make an adjustment to the shifter. Just a guess, thats why I’m asking for clarification. Maybe the NuVinci guys at Fallbrook could shed some light on this. Kevin Ressler, ScooterFaster Phoenix AZ. I think this may be a matter more of feel than any necessity to change gear ratios. With a traditional bike I find that a slight change in grade does not necessarily mean I’m going to change gears. But I found with the NuVinci, even with a slight change in grade, I was able to feel a difference in the ride. That prompted me to make very slight adjustments to the gearing ratio, and that made cycling more comfortable. In a way I think it’s just an issue of how responsive the system is in that it will allow you to make very small changes, less than the difference in a single step in traditional gearing. I’m not a mechanical engineer so I can’t tell you why I felt what I did, I just know that was my sense. At the same time, changing gears on a traditional bike has a cost in the power interruption that goes with the change. There was no interruption with the NuVinci so I was more inclined to respond to slight variations in terrain. I have had the NuVinci hub. It’s mechanical efficiency is noticeably lower than a derailleur setup. I went back to the derailleur. I have read some blogs where cyclists cannot find out what the actual mechanical efficiency of the hub is. Also, if something breaks in the NuVinci, you cannot fix it, whereas the derailleur setup is relatively easy to fix and get back on the road!!! I also have a GS GTO. I am looking at installing a Ecospeed system. I am very interested in your feedback concerning the system. Such as: have you had any maintenance issues?, what is the after sales service like? Are you happy with it’s performance? Do you tow any trailers with with your trike? I have a trailer that I currently tow with my family. Gross weight at the moment and climbing as my children grow is 550pounds. I long have you had the ecospeed for? I imagine you had 3speed sram hub prior to your Nuvinci. How happy are you with the system compared to the previous hub. Not sure I can answer all your questions, but I’ll do my best. I have had the Ecospeed for more than three years. For the most part the performance has been great. I did fry an early version of its controller, but that was replaced a year and a half ago with a new model and I’ve had no problems since. I had two instances where the throttle switch fell apart, but again, a newer design has addressed that problem. Ecospeed says you can expect about two years worth of use out of its battery. After three years mine is starting to hold less of a charge and will probably have to be replaced soon. That having been said, I’ve found the after sales service experience with Ecospeed extremely professional and pleasant. They have resolved any issues I had, whether with phone advice or parts replacement. I think you may have an issue with the weight you’re trying to tow. It may be fine on the flats, but I question how much fun you’ll have pulling it up a hill. I suggest you check with Ecospeed before taking the plunge. 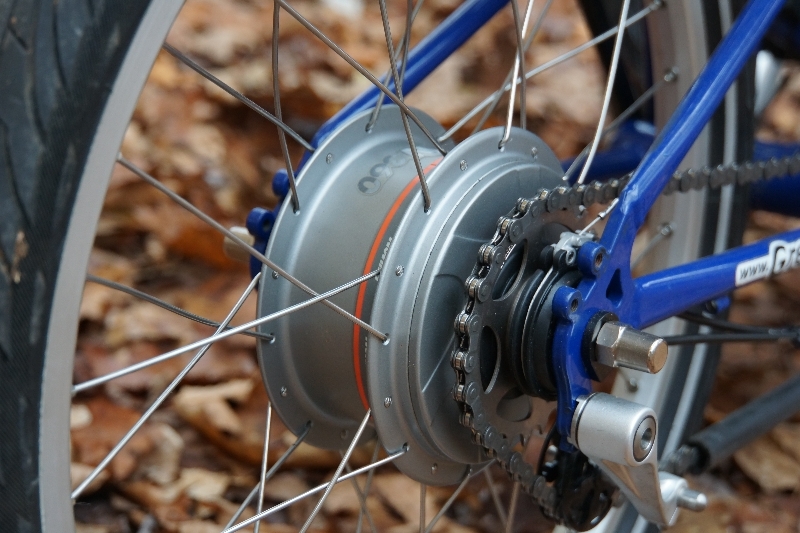 Finally, as to the hub, the Greenspeed came with a rear hub with three internal gears and nine external. The range exceeded what I get with the Nuvinci, but there were issues of slipping gears, and straining cables that I have not had with the smooth shifting of the Nuvinci – but its definitely a trade-off. Bike commuting is up 10% in 2012 over 2011 in the US. A little less than 1 million people bike commute. This is census data released at the end of last year. Not sure about recreational cycling though. Definitely a lot more.